Beach dunes. To some people, they are the weedy mounds of sand that make navigating the beach a nuisance. To others, they add natural beauty to coastal landscapes. Like them or not, Wilfrid Laurier University researcher Mary-Louise Byrne says the dunes are just doing their job – keeping the sand at the beach. Byrne, who teaches in Laurier’s Department of Geography and Environmental Studies, investigates sediment transport and management processes in Southern Ontario’s beach-dune systems. She has conducted research at Sauble Beach, Point Pelee National Park, Sandbanks and Pinery provincial parks since 1983, warning that how sand accumulates, moves or diminishes in a beach environment affects more than where to put a beach blanket down. Sauble Beach, located in the town of South Bruce Peninsula, is one of Byrne’s research sites. 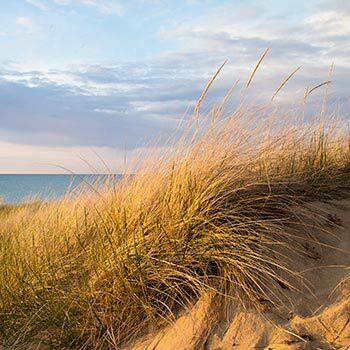 Situated along Lake Huron’s east coast, Sauble Beach offers more than 11 kilometres of sandy beachfront and attracts over 800,000 tourists each year. Local businesses enjoy the financial injection that beach tourism brings to their economy each summer, but that boost comes with an environmental price tag. The township has groomed the beach in previous years as part of its sanctioned beach management plan. While the grooming makes room for beach-goers, it uproots some of its residents, such as the population of piping plovers, endangered shorebirds that have nested at Sauble Beach since 2007. Maintaining “clean” beaches has caused tensions for the town of South Bruce Peninsula. In April 2018, the Ministry of Natural Resources and Forestry filed charges against the township for allegedly damaging a restricted piping plover habitat while raking the beach. Byrne’s dune research at Sauble Beach isn’t just for the birds. Raking the beach flat diminishes the quantity and quality of sand, which can also impact the human environment. Friends of Sauble, a local environmental group for which Byrne has consulted, has asked the township to take action to stop further wind-related sand loss at the beach. They hope to re-install fencing at strategic points along the beach to keep sand from blowing onto nearby streets. Sand-rich dunes also act as a natural barrier between beachfront properties and the lake. When water levels rise, dunes release stored sand back to the shoreline and counter the impact of the waves. “When we remove those dunes to create a postcard-perfect beach, rising water levels have an open invitation to explore beyond the shoreline,” says Byrne. Several opinions have surfaced about how to maintain Sauble Beach’s shoreline: some favour a fully groomed environment while others advocate for a completely natural landscape. The veteran beach researcher sees both ends of the spectrum. Blending what is best for the beach with the wants and needs of its visitors is an aspect of Byrne’s long-term experimental research project at Point Pelee National Park in Leamington, Ont. The park is home to one of two populations of the endangered five-lined skink, the only lizard species indigenous to Ontario. The four-inch long lizards are recognizable by five cream lines that run vertically down their backs. Juvenile skinks also have a bright blue tail. Point Pelee’s skink population has been threatened over the last 150 years, as recreation and tourism have encroached on their beach habitat. Since 2009, Byrne has worked with park officials and other ecologists to re-naturalize a half-kilometre portion of Point Pelee’s northwest beach to restore a skink ecosystem. Beachfront parking lots and change room facilities have been relocated to another section of Northwest Beach. Asphalt has been replaced with sediment and indigenous vegetation has been relocated from other parts of the shoreline to establish new dune systems. To protect the rehabilitation work while improving the visitor experience, the park designated a 200-metre stretch of groomed beach for visitors and recreational activities. Laurier Master of Science in Geography student Pritichhanda (Priti) Nayak’s graduate research contributed to the project’s restoration strategy. Her yearlong study examined the impact of the park’s land use on behaviour and growth patterns of indigenous vegetation. Leveraging aerial photography and satellite imagery, Nayak’s research covers a century of topographical change at the park – a significant resource for the project. The geography student’s research will inform habitat reconstruction guidelines for the five-lined skink. The guidelines will be useful for Point Pelee National Park management and have applications for any park and protected area with sand dune ecosystems. Byrne and Nayak’s work at Point Pelee is the source of a co-authored paper on the park’s sand dune restoration for a special issue of The Journal of Marine Science and Engineering focused on coastal dune dynamics and management. The issue is due out in early 2019. Since beginning the project almost a decade ago, the park’s endangered hop trees have started to regrow where parking lots once stood. Skinks have also been spotted nesting in the trunks of trees that were removed and left as beach debris as part of the project.